We’d have liked to spend more time in Suffolk, but the original plans were scuppered thanks to a business meeting back in Yorkshire. Fortunately, we saw enough to make us want to revisit the area and ensure that the time was devoted to pleasure rather than business. Neither of us had been to Suffolk before, but taking a look at comments made in Lonely Planet’s Great Britain guide and the National Trust handbook, there was more than enough to take a look at at least once, if not twice in some cases. As the forecast was in our favour, accommodation and food costs plummeted as we decided to use a trusted Vango backpacking tent for the trip. No, you can’t stand up in it, but there’s plenty of room inside, especially when the rest of the kit is stored in the Skoda next to the tent. The first day was a mix of travelling, eating and finding our way as we still use road books rather than rat nav. Campsite choices had been made via www.ukcampsite.co.uk. The first was Mill Hill Farm Caravan & Camping Park near Darsham (£13 a night for two people, that small tent and a car) and the second was Brighthouse Farm near Lawshall (£8 a night plus £1 each for shower tokens). After a decent night’s sleep, some good coffee and a couple of bacon butties, we set off with the intention of heading to Southwold for a wander around and Sunday lunch. That didn’t happen. The Southwold part did, but lunch ended up being coffee, scones and ice cream at a beach cafe after a front tyre punctured and the wheel nuts wouldn’t budge. When the rescue service turned up, everything was sorted in five minutes. The local tyre provider was closed for the day, so we headed off in search of a new tyre elsewhere and/or lunch. The tyre search was abandoned after an hour, so we headed for Southwold. Once parked, we headed onto the pier Southwold Pier is one of those that has been looked after and whilst the shops along it were a bit on the pricey side for us, the views, Steampunk style features and more meant we spent time looking rather than glancing and wandering off to somewhere else. Like the prom… Well, I was on the prom and Caroline was on the beach as I have problems walking on soft sand or snow. While Caroline made the most of the waves upon the sand, I sauntered along taking photos of the pier, beach huts and Southwold’s famously inland lighthouse. The town itself is reminiscent of town centres of old (well, the sixties and early seventies before developers turned towns into identikit locations) with only a few names that I recognised from home. With Sunday trading hours and the earlier puncture time-bombing our exploration of Southwold, we only had time to take a look around a couple of places. We did make a promise to ourselves to make a return visit at some point, even if it was just to take a longer look around the Adnams shop and to book a place on the same company’s brewery tour. 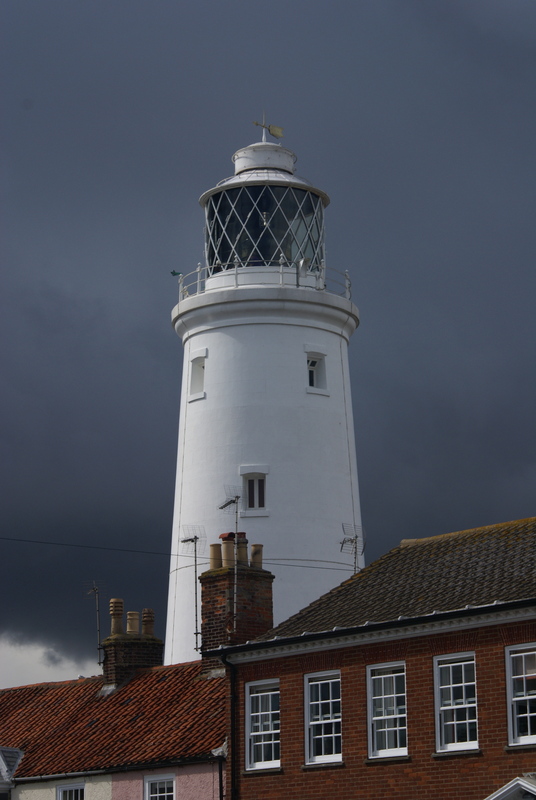 With a sudden rain shower putting a real dampner on things, we headed back to the car and onwards to Aldeburgh. Yes, it was Sunday after 5pm and it was still raining, but there were a few places open and as we’d been cheated out of lunch, a decision to go for a sit down fish supper was made. After getting the tyre replaced on Monday morning, one place that wasn’t in the guide books beckoned – Flixton Air Museum. A poster in the washing up area at Mill Hill announced its presence to one and all and the low key approach to promotion paid off, because it was a gem that was both free to enter and worthy of a couple of hours wandering around. Now I have been to some air museums which charged admission fees that weren’t worth the money, but with displays including classic planes such as the Lightning, Sea Harrier, Canberra, Meteor, Hunter and Javelin, there was enough to make me want to put a decent donation into one of the collecting boxes around Flixton’s hangers. 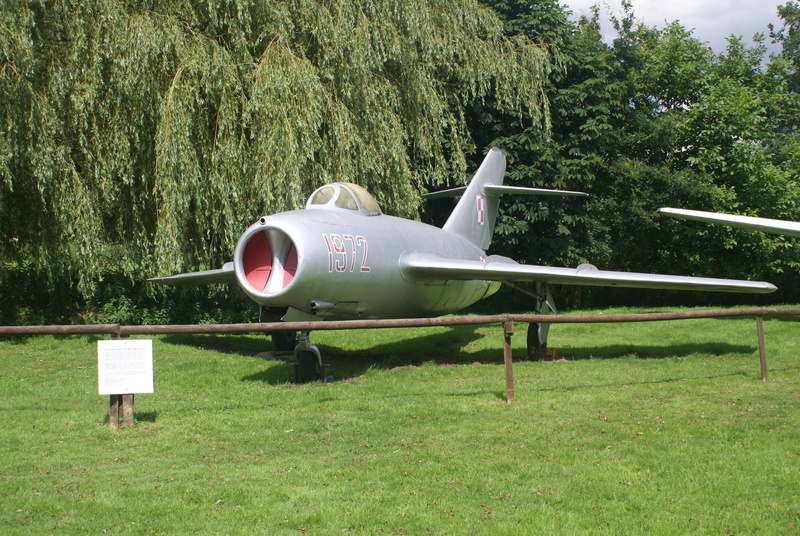 MIG fighter at Flixton… Fortunately there were a host of other items in the museum to keep Caroline’s interests up. One display in particular fascinated her as it caught the attention of her artistic eye. Some exhibits were recovered parts of crashed aircraft – part ghoulish, but also with that previously mentioned air of fascination too. My thoughts went in a different direction as my late father apparently survived forty-odd missions onboard Lancaster bombers. With NAFFI scones and coffee for lunch, we headed back to Aldeburgh for an afternoon of wandering along the beach (or the shingle in my case as fishing boats and other items provided interesting photo opportunities). With Caroline investigating a large sculpture she’d seen further along the coast, I decided that it was time for an ice cream and a cold drink and a chance to wonder why I’d not listened to more of Benjamin Britten‘s music. 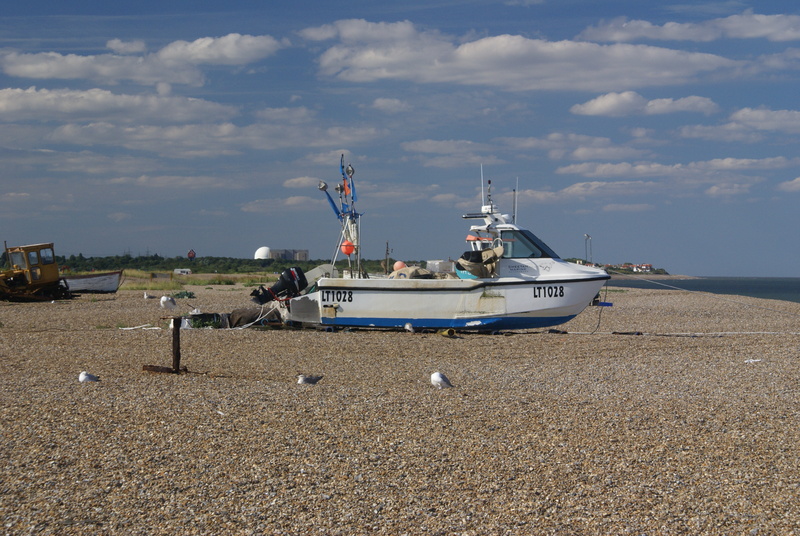 One better day – fishing boat on the shingle at Aldeburgh The following day saw us striking camp and heading off towards Brighthouse Farm, but there was a major stop to be made. As I’ve mentioned elsewhere, Caroline’s the history buff and I’m all for Horrible Histories, but when you have a brace of National Trust cards between you and one of their crown jewels isn’t far away, then yes, you do spend best part of a day exploring Sutton Hoo. With the main finds on display in The British Museum, it’s good to know that the replicas on show at Sutton Hoo don’t disappoint. 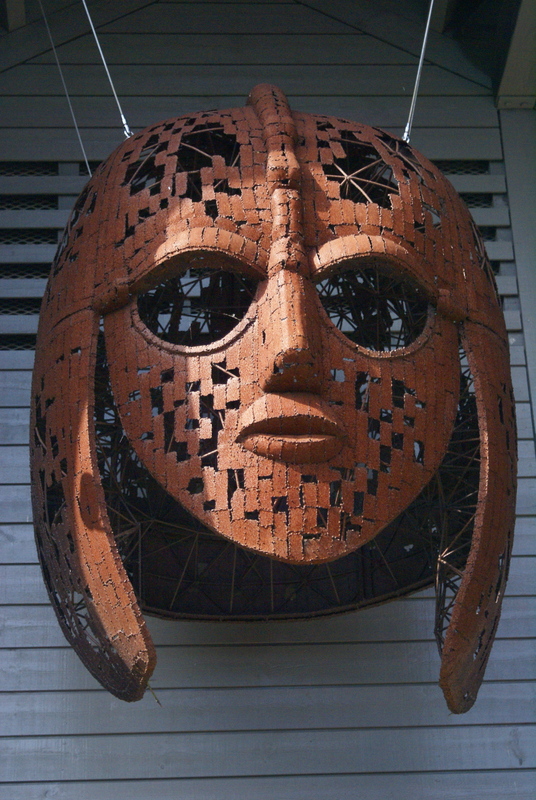 That large version of the iconic Sutton Hoo helmet (as seen above) is above the door of the main visitor interpretation centre, but the smaller version inside is exquisite. I didn’t go on the tour around the burial chambers, but Caroline did and was rather enthusiastic about the experience afterwards. Would we go back to Sutton Hoo? Oh yes, but we would ensure it was out of term time or early on before any school parties arrive. With two days and nights left, we made our way up to Brighthouse Farm to find that the site fees were smaller than those mentioned on their website, so we paid that £8 per night instead of £12 and found that we could spread out and even have our own picnic table to cook by and eat at. Although we’d taken some food with us, we did buy locally too and found some local ales and cider to help the meals go down. Although we have cooked from scratch in the past whilst camping, we were being lazy this time and most of our food came from packets or tins in order to save money and gas. With no sore heads the following morning, it was time to head out once more and give our National Trust cards another outing or two. It’s not often that there’s two properties so close together, but the plan had been hatched to head to Lavenham to look around Lavenham Guildhall and to have lunch before heading out to the much larger Melford Hall. Lavenham is almost like the land that time forgot. The roads are relatively quiet, the car parking is free, the place is peaceful and the only signs that you’re not in the land that time forgot are cars, the modernised innards of the Co-Op and the name of a well-known chef that’s at the top of one of the pub signs near the Guildhall. The Guildhall is quite small, but it tells the story of the area and the local blue cloth too. The platter on offer for lunch in the small cafe was more akin to a posh ploughman’s lunch, but both plates went down well, as did the coffee and soft drinks. What we didn’t realise when we went to Lavenham is that it has been the location for major feature films such as Witchfinder General and the last two Harry Potters whilst the area (including Lavenham) was used as the setting for a television series that’s still being shown today- Lovejoy. We didn’t get the chance to explore the village of Long Melford, but Caroline took time out for a wander around Melford Hall, although parts of it were closed at the time of our visit as the roof had leaked and some damage to carpets and furnishings had occurred. 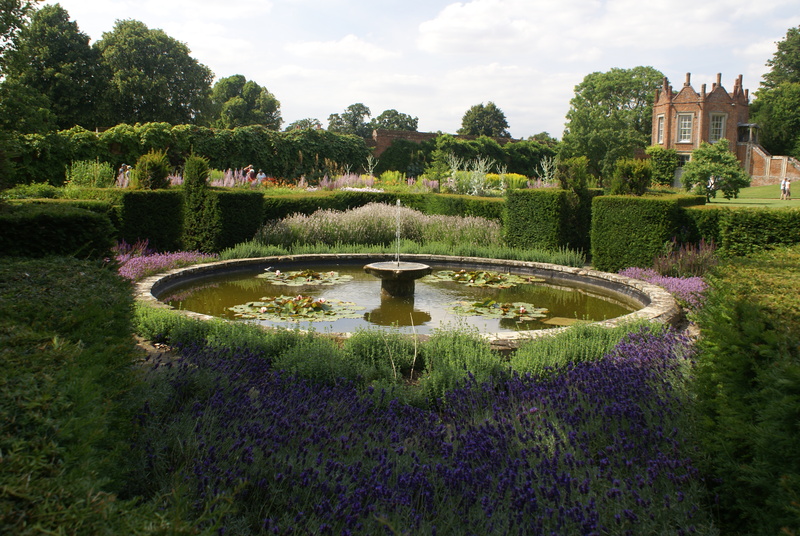 The gardens at Melford Hall (a National Trust property). We did however wander around and take a couple of relaxed drinks in the garden, but as closing time beckoned, it was time to head back to the campsite and a chilli that benefitted from the addition of red wine from the bottle that had been bought to accompany that evening’s meal. After packing up the camping kit the following morning, we headed off in a northerly direction once more, but we did have one major stop to make along the way. Ickworth near Bury St. Edmunds is suitably grand National Trust property with the house only open on certain days of the week. 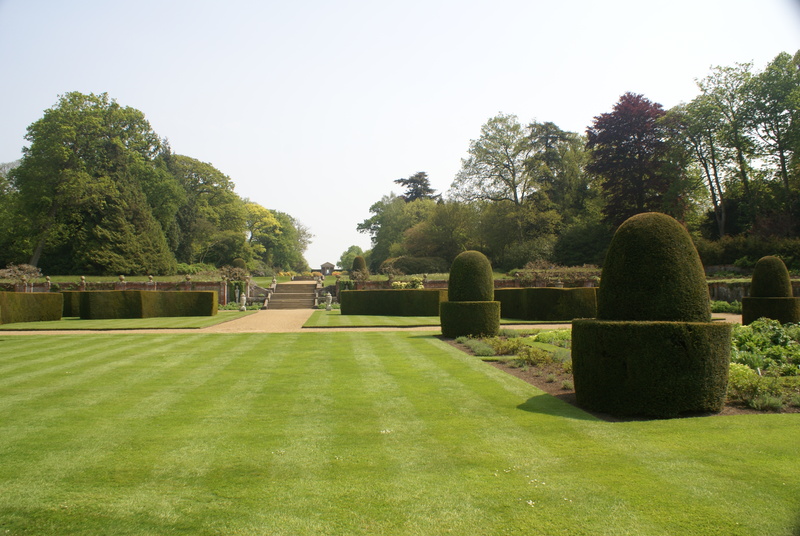 The grounds are more accessible however with the gardens, shops and restaurant being open virtually all-year round. I decided to sit outside and chill whilst Caroline explored the main house, but it was one of the hottest days of the year and with little in the way of shade available, I headed back into The West Wing to find somewhere cool to sit before heading in for lunch and then back to the car for the drive home. Our five nights and six days in Suffolk were relaxed, peaceful and very pleasant. As we headed home, we reflected on the fact that we’d never been there before and could quite easily have spent at least another five days on a more thorough exploration of the area. Okay, what started it all? My first visit to the Lake District some 42 years ago as part of my Duke Of Edinburgh’s Award expedition training. The venture had been arranged through school and our expedition trainers from Number 3 Army Youth Team, Royal Engineers. It was also the first trip away that didn’t involve any kind of parental presence! We stayed in premises near The Golden Rule pub in Ambleside – a bunkhouse with basic cooking and washing facilities and enough beds for the Army guys, us and the teachers who had given up their weekend off to supervise us. Yes, it was an all-male affair at that hut back in the early 1970s as the female contingent were staying at Ambleside Youth Hostel on the shores of Lake Windermere and they were doing different walks to us. If memory serves me right, our first walk was over Scandale Pass to Brotherswater and then back over to Ambleside via Kirkstone Pass Inn. As we were all under age and there were teachers with us, there wasn’t the chance to down a pint at lunchtime, so thoughts were more focussed on the map reading and the surrounding countryside rather than staying on our feet and pointing ourselves in the right direction. Was it Worthington E or Watney’s Red Barrel? The name of the brew is lost in time, but the half went down well and my sensible head took over and ensured that it wasn’t followed by another one. The second day’s walking was somewhat easier – over Loughrigg and back before getting back into Ambleside, picking up our holdalls and getting the bus back home. That first trip wasn’t the last one as most of us went on our first camping venture for the Award – to Neaum Crag camp site near Skelwith Bridge. Then came a winter venture based at Ambleside Youth Hostel with a day on Fairfield and a snowball fight with the teachers on Loughrigg… But I’d already been bitten by the bug on that first trip. In the years since then I’ve walked in the UK, Norway, Switzerland, Austria, France, Spain, done some climbing and biking, headed out on cross-country skis in Norway, Austria, Scotland and County Durham and travelled to a few other places too to see what’s out there. I’ve also been an instructor for a local authority where part of my remit was to train youngsters up for the expedition section of The Duke Of Edinburgh’s Award and last, but not least, I became a writer on a range of walking and other outdoor/travel titles and worked on the magazine that had helped nurture my early interest in the outdoors – Climber. When the latter came calling, i’d successfully gone from rock to rock as I’d been a music writer for a few years too doing live reviews, album reviews and interviews too. Oh, and had managed a trio of bands too. 160 bands in a year? That’ll do nicely! The skills learned in the 1970s and at Glenmore Lodge when I did my Mountain Leader training in the 1980s are still used, but not as often as they used to be after a stroke a few years ago. Sometimes I can do thirteen miles in a day, sometimes it’s four – it just depends on how I’m feeling at the time. The memories don’t go away though as I found out when Caroline and I headed to the Lakes last year. We’d found an apartment near Ambleside whilst trawling the internet for accommodation. Small, comfortable and just what we needed to do some walking, photography or cycling as the leaves changed colour in time for Autumn. By sheer coincidence, the apartment was part of the complex at Neaum Crag near Skelwith Bridge that emerged when the camp site I’d visited in the 1970s was closed down in the 1980s…. It’s six years since we first visited North Norfolk, but the tally of visits now stands at eight and we reckon that there could be a few more. The decision to base ourselves in an en-suite room at the self catering Deepdale Backpackers hostel at Burnham Deepdale for a few days paid dividends. We’d decided to go indoors rather than on the adjacent campsite as the weather forecast hadn’t been wonderful and my camping kit was still here, there and everywhere after moving house (we’ve used the campsite on two occasions now, and there’s no problems with it at all – quiet, relaxed and as laid back as the hostel). So, there we were, 160 miles from home, with some walking kit (The Peddar’s Way is nearby), some food and a couple of maps and no idea of what we were going to do or where we were going to go. Did we know what was in the area? 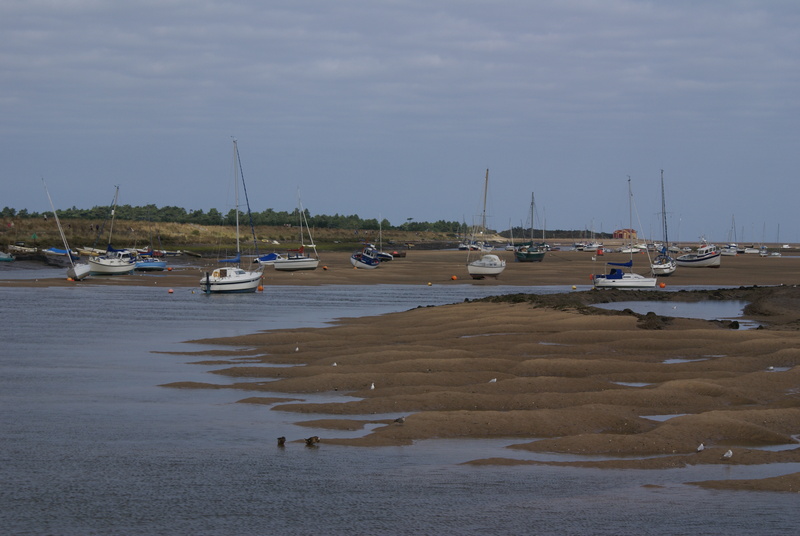 Not really, even though North Norfolk had been featured on Coast, Countryfile and had served as one of the locations for the Stephen Fry series Kingdom. Fortunately, the reception area at Deepdale Backpackers is also a tourist information centre, so leaflets were picked up and read over that night’s evening meal/lounging around with a bottle of wine. I’ve got back into photography and Caroline’s an artist when she’s not working as a nurse, so light can be quite important to both of us in many ways. We’d holidayed in St. Ives and Paphos a couple of years beforehand and had appreciated the way the light changes through the day – something that I’d also noticed when driving through Glencoe a few years ago, whilst having the first coffee of the day on a campsite in The Lake District last year and in Haworth a couple of weekends ago. Many of those staying at Deepdale Backpackers were heading off to the RSPB sites at Snettisham or Titchwell, whilst others were heading to the Norfolk Wildlife Trust site at Cley Marshes. Others were heading to Pensthorpe, a reserve site that had provided the BBC with an ideal location for Springwatch. Now we aren’t too fussed on birdwatching, but we had heard about one regular event that was worth getting up for in the early hours of the morning. It was (and still is) the Wader Spectacular at RSPB’s Snettisham reserve. Getting up early was a shock to the system, but after a couple of mugs of strong coffee, the car was pointed in the right direction, parked up and we headed down to the beach to see what all the fuss was about. And we weren’t disappointed as it was one of the greatest free shows we’ve ever seen. As the tide comes in, waders such as Knot gather together before suddenly taking off and wheeling and performing aerobatics over everyone’s heads. Around a hundred or so people were also witnessing this and every one of them was in raptures as the thousands of birds took off and flew in almost silent formation for several minutes before heading inland towards nearby lakes. It’s a cliche I know, but words can’t describe the experience, even though we’ve witnessed it three times. Snettisham isn’t the only beach we’ve walked on in North Norfolk – those at Hunstanton, Wells-Next-The-Sea, Sheringham, Cromer and Holkham all spring to mind. 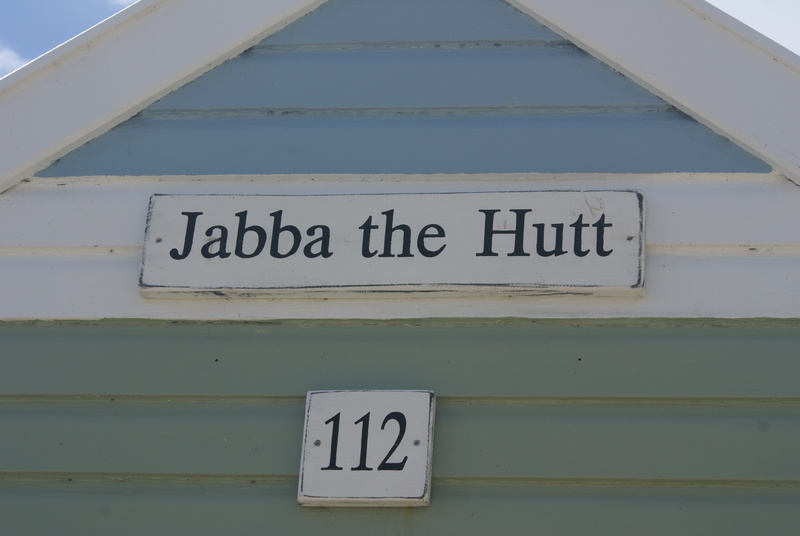 Hunstanton’s is below the multi-hued cliffs whilst Wells is a fair walk from the harbour and town centre. Sheringham and Cromer are interesting at any time of the year – unless of course it’s February or March and the temperature without the wind-chill factor is below zero! The beach at Holkham is quite possibly one that you’ve seen without even realising it. Remember the beach that Gwyneth Paltrow walks on at the end of Shakespeare In Love? Yes, it’s Holkham Beach. It can get busy at times, especially when the sun’s out, but if the car park’s quiet then it’s a gem. As is the nearby Holkham Hall. The gardens, grounds, museums and house are all open to the public, although it’s best to check exactly when various parts are open to the public. On the occasions when Caroline has taken her touring bike to Norfolk or she’s hired a bike, she’s loved riding through the grounds of Holkham Hall, especially when it’s early in the morning or late afternoon. As Caroline’s a history buff (I’m more into Horrible Histories…), she went around the hall on a guided tour and spotted that one part looked familiar. On asking the guide why, it was because the hall had been used as a film set. When Keira Knightley’s character is running upstairs with her hair on fire in The Duchess, the staircase is in Holkham Hall, but the room she runs into is in Chatsworth House in Derbyshire. Steam trains are also a part of the North Norfolk visitor experience. The Poppy Line runs between Sheringham on the coast and the inland town of Holt. It’s a short trip and once you get to Holt, there’s a bus service to take you into the town centre. Holt may be small, but it’s a busy town, so if you’re planning on driving instead, then it’s worth getting there early as car parks fill up quickly. Although there’s a host of interesting shops in the town, one fine reason to visit is Bakers and Larner’s department store. It’s shopping as it used to be – refined, unhurried and with a very good food hall. As a past customer of Fenwick’s in Newcastle-upon-Tyne and a one time only customer of Fortnum & Masons in London, I always ring-fence some of the holiday budget when in Norfolk in order to stock up on a few things. At least one picnic lunch is bought, alongside chocolate and a box or three from the selection of Turkish Delight that lines the shelves. Bread, biscuits, coffee, cider and beer have also found their way into the shopping basket with the result being a bigger bill than we would get at our local branches of Sainsbury’s or Lidl! The train’s starting (or finishing depending on which way you journey) point of Sheringham may be small, but it’s a town with a good YHA hostel (2014 was the first year in which we haven’t stayed at Deepdale Backpackers – both are equally fine hostels though!). 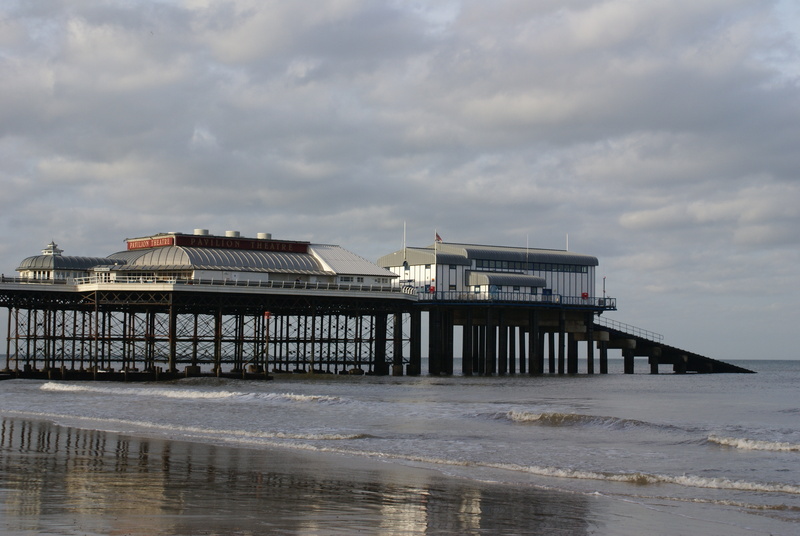 Down the road is Cromer with its fine beach, pier and lifeboat station. There’s also the lifeboat museum and plenty of places to wander around at your leisure. It’s a great place to stretch your legs in at any time of the year, but with that light at its best, autumn is the personally preferred time to visit and because it’s quieter, parking is a lot easier. Even though we’ve visited the area so much in recent years, there’s still places we haven’t been to yet. We’ve also headed out on one of Bean’s Boats from Morston Quay to take a look at the seal colony on Blakeney Point and Caroline’s tasted and bought a few bottles of different ciders from Whin Hill Cider in Wells-Next-The-Sea. Caroline’s also explored the area by bike too on her own tourer or on a hire bike from Deepdale Backpackers. Cycle routes are well documented and signed, but Caroline also makes her own up and lets me know by phone when there’s a signal where the best place is to meet up for lunch (preferred favourite is the cafe at Holkham Hall – very good sausage baguettes, scones, slabs of cake and either coffee or interesting cold drinks). 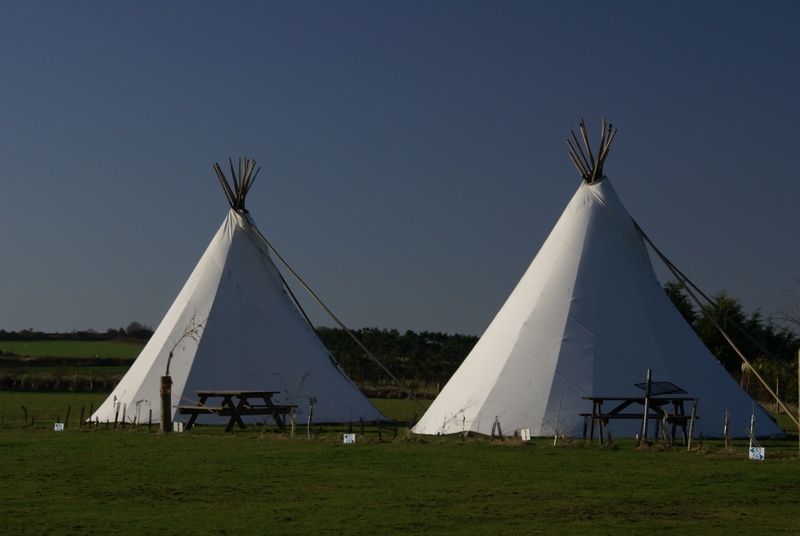 Whilst it’s tempting to head back to North Norfolk this February, camping at Deepdale Backpackers may be out, but they do have Tipis, Yurts and Shepherd’s Huts available as whilst we have tents, we don’t have a camper van that can be parked up and used for the duration (Deepdale Backpackers do have one to hire though). Thanks to Rohantime for posting this one from the wisepacking files a few minutes ago! Greetings from a partially snow covered Yorkshire. It’s bright, it’s sunny and there’s snow on the ground – just a light cover mind, but snow nevertheless. It’s not going to last though. The brisk walk up to the local shop an hour ago wasn’t through a full covering of snow and a quick glance out of the window now I’m back indoors has revealed that the multicoloured gnomes in the back garden have lost their frosty coating. There is a breeze though and the temperatures are low, hence the choice of layers for that walk. Which were pretty much the same as what I’d have chosen had I been heading out for a wander through the woods to the pub or for a day out with a pack in the country or on the hill. First up was an Icebreaker merino base layer, then a Patagonia Snap Neck fleece pullover and then a North Face Nuptse 900 LTD down jacket. On the legs were a pair of Peter Storm soft shell trousers, a pair of Bridgedale socks and a pair of Salomon boots. If I had been in the country or on the hill, then the chances are that the Nuptse would be in my pack and used when lunch or coffee breaks were declared. I’d probably be wearing a fleece gilet and a soft shell instead (the old faithful TNF hooded soft shell has just been reproofed with Nikwax Soft Shell proofing) and have a pair of gloves and a mountain cap in the pockets, just in case. Oh, and a pair of base layer leggings too. A base layer, bike shirt, fleece and reflective waterproof jacket do the job in virtually all weathers on both her leisure rides and her early morning/late evening commutes to and from work. But layering doesn’t have to be used solely outdoors. We both wear layers around the house over the winter months – they keep us warm and comfortable and help keep the bills down so we’re not laying down the foundations for big gas bills later in the year. Does it work? Yes, as it was a tactic I first used thirty-odd years ago as the first house I had after leaving home was an exposed, not very insulated farmhouse with single glazing. We’ve also used the same techniques elsewhere too, most recently in a place that had a wood burner in the lounge. Not saying it was cold, but we were both in there wearing merino base layers, fleece pullovers and down vests and were just about warm! Mind you, it was even colder down on the beach the following day – thank goodness for high quality down jackets! I’ll be going into more layering next week as there’s a round-up of base layer principles and some product reviews too happening on wisepacking. And we’re prepared for it – right down to the home baked cheese scones that are being baked this afternoon and a good bit of comfort food for tea. Beef stew with dumplings and mashed potatoes. Cooked from scratch, not from a tin or a supermarket freezer section! Yes, we’re twelve days into 2015 and if the news/opinion/conjecture is anything to go by, it could be a good year for travelling. Will the exchange rate (pound v euro for example) stay favourable? Will air fares come down thanks to the price of oil and changes to APD charges? Will George bite the bullet on Budget Day and drop APD charges as a sweetener in the run-up to the election in May? Will more people head off to foreign shores as a result? Or will they stay at home in the UK and take advantage of the current lower fuel prices? And lower food prices if self catering thanks to supermarket wars? Will travellers cut down on tech and talk to real people in hostels and destinations rather than immersing themselves in what’s onscreen on their smartphones, tablets or laptops? Or realise that you can travel on hand luggage only, even if it’s a three-six month trip? Our trip list for 2015 has been discussed, but there’s a couple of late suggestions going into the melting pot. One is a visit to Northern Ireland to visit Bushmills, Giant’s Causeway and the Armoy motor cycle road races. The other is to visit a place that’s been mentioned a few times, but has come to the fore once more thanks to the book I’ve just finished reading, watching Casablanca last week and news stories over the last few days. I’ve walked in the Jura and in Provence, but we’ve never been to Paris. Greetings from a sunny and chilly West Yorkshire! A good bacon buttie that wouldn’t defy a politician’s attempts to eat it for lunch whilst the car was being sorted out in the Brighouse branch of Kwik Fit next door and then some fine Yorkshire cooking before a classic film last night. Chicken Dansak with rice for Caroline, Lamb Bhuna with chapatis for me plus a meat mix starter and salad delivered to the door. Empty food containers and very clean plates tell their own story! The film? Not Puss In Boots that’s for sure – we watched something in black & white that has a load of quotable lines. Here’s looking at you kids!